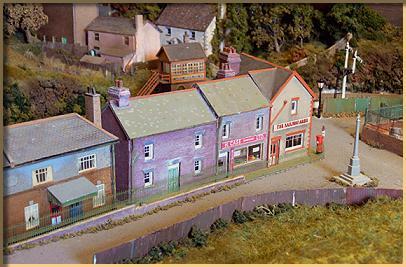 Wyvant is a South Wales-themed GWR/WR layout modelled in OO. 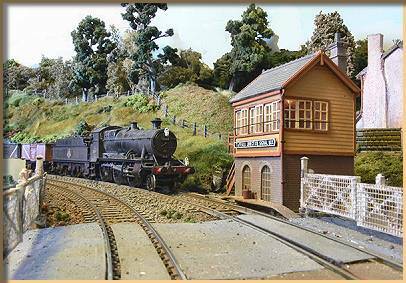 It's a 14' x 6' continuous run with a through station serving two branch lines at either end. Trackwork is Code 100 Peco – wish I'd gone for Code 75 now, but never mind. Control is conventional DC through a Gaugemaster controller. 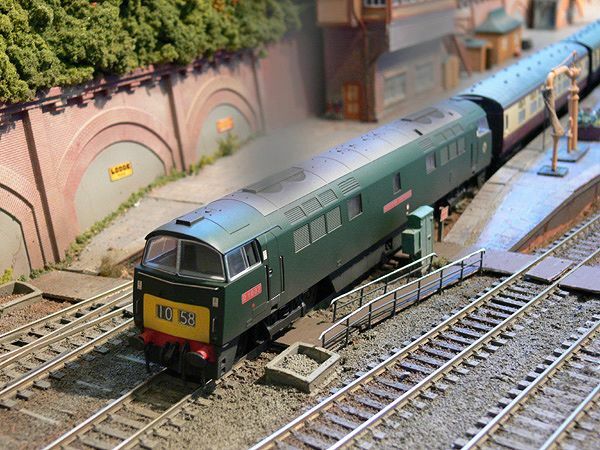 I'm really tempted by DCC, but it'll have to wait until I summon the bottle to tackle my large number of Bachmann split chassis locos. 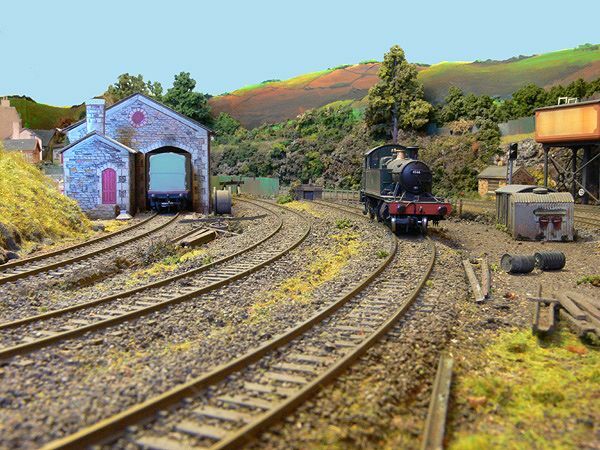 I started work on the layout 10 years ago, but almost all the visible scenery and trackwork has been laid down since 2001. The shot above was taken in 2005, since when the station throat has undergone a major reworking, necessitating the demolition and replacement of the overbridge. The steam effect in the photo was created in Photoshop. 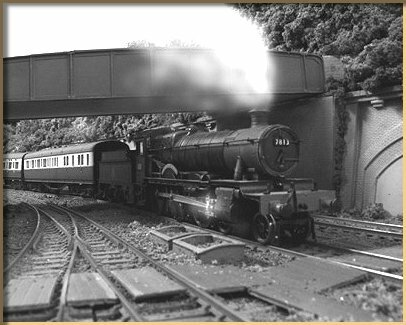 One of the line's Bachmann 56xx tanks running into the new branch platform. 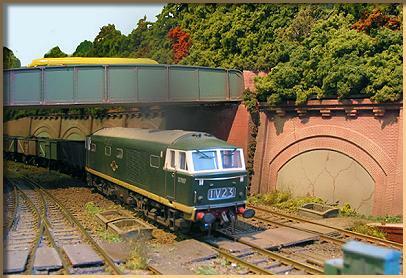 I love these models: they've made shunting a joy rather than a nerve wracking ordeal. 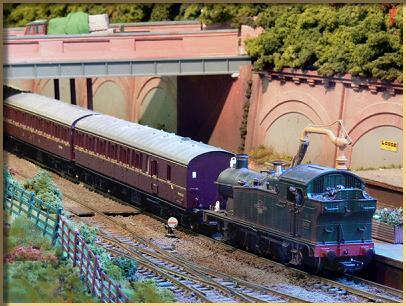 The carriages are Bachmann suburbans, close-coupled using the excellent Keen units. 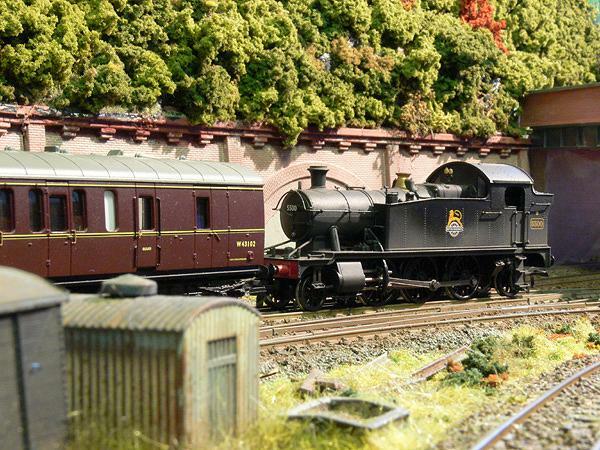 The carriages could do with a bit of weathering. 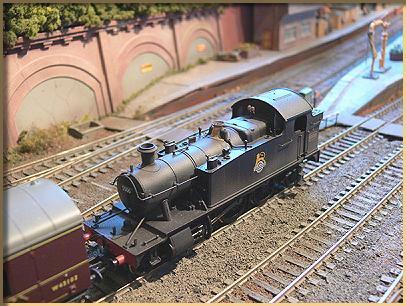 Looking across the goods yard, with a Bachmann Prairie loitering. 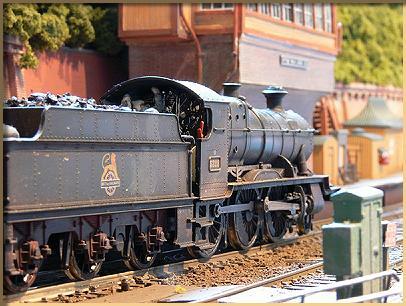 Again, I'm smitten with these models. I'd love a 72xx to the same standard. The shed is – I think – a Metcalf product, this one a Settle & Carlisle prototype which I'm in the process of half-heartedly "Great Westernising"
Looking down Chapel Street towards the corner pub. The road surface really needs reworking. For me roads are a constant battle between not enough texture and too much. The station area, showing the new footbridge. After scrapping my first effort, I bit the bullet and ordered three of the new Metcalf footbridge kits, which have been spliced together to create this effort. I Great Westernised it by embossing all the printed detail, overpainting the Metcalf colours with thinnish washes of light and dark stone, and then used Evergreen strip to add the framing. I also added some Scalelink mesh to the sides of the bridge. I ditched the Metcalf roof and made my own from plastikard, and also added interior lights. 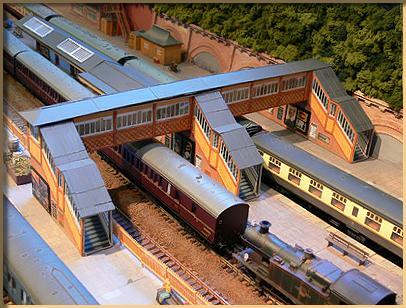 Although some of the stock is post-nationalisation, I've decided that all structures will be painted according to the GWR rules, not WR: i.e. shades of stone, rather than choc and cream. There's no real logic to this, but I do like to run pre-nationalisation sessions (got to justify all those Slaters wagon kits!) 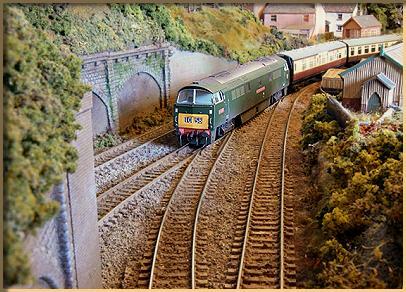 and I reckon it's slightly less incongruous to see WR trains running through GWR scenery than the other way round. There are certainly colour shots of some WR structures which suggest that they were still in the stone scheme well into the fifties. 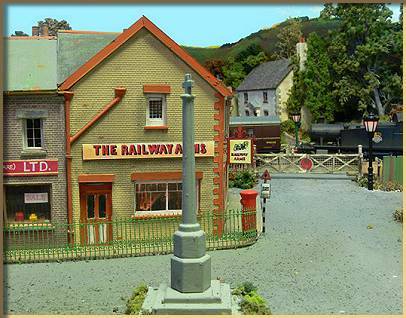 More pictures of Wyvant can be seen on Al's blog on RMweb.